The Carnegie group has mounted a major initiative to create the next generation high-pressure devices based on large single-crystal diamond anvils grown by chemical vapor deposition (CVD). The above photograph shows a synthetic brilliant cut single-crystal diamond grown by CVD. About 2.5 mm high, this crystal was grown in about 1 day at Carnegie. 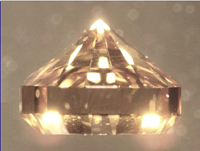 The very bottom (table) of the crystal is a type 1b seed; hence the yellow tint which is due to internal reflection (the CVD diamond is transparent). These CVD diamonds are capable of easily generating ultrahigh pressures up to 200 GPa [W. Mao, et al., Appl. Phys. Lett. 83, 5190 (2003)].Our CVD technique has now been combined with a high-pressure/high temperature annealing process to produce material that is significantly harder than any other diamond-based material. [C.Yan et al., Phys. Stat. Sol. A 205, R25-R27 (2004)] (read the abstract). Our single-crystal diamonds were first produced in 1998 and reported in C. Yan et al., Proc. Nat. Acad. Sci. 99, 12523 (2002). For more information check out the recent story in Nature Online and follow these links.